Slick Trick Bubble Trick Pack: Learn how to blow amazing bubble creations. There's something magical about floating bubbles that enchants young minds. 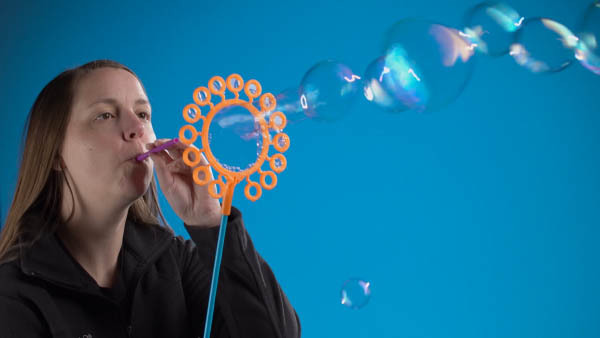 And with some practice and the right tools, you can blow bubbles that’ll blow anyone's mind. 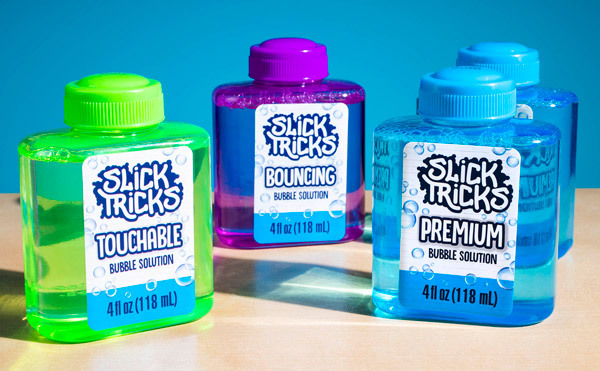 The Slick Trick Bubble Trick Pack includes the tools and instructions you need to create truly amazing bubbles, including bubbles you can bounce in your hands, bubbles you can put inside of other bubbles, giant bubbles, clusters of tiny bubbles, and even a bubble with a hole in it! 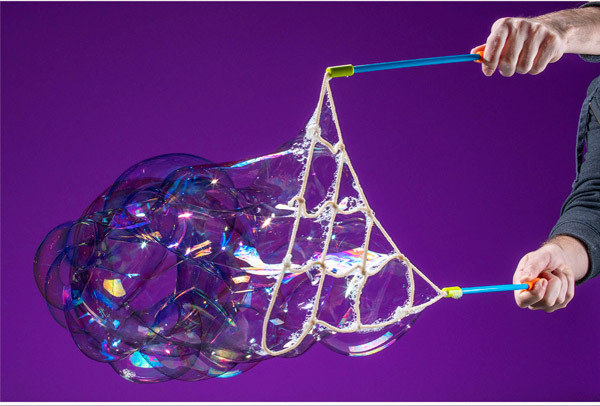 Master the 20 included bubble tricks and become the most captivating performer in town! Learn the secrets to bubble tricks such as bouncing bubbles, dancing bubbles, cube bubbles, and more! Impress lookers-on and entertain your friends with the Slick Trick Bubble Trick Pack, a set of tools and instructions that turn you into a bubble-conjuring wizard. Between giant bubbles, snakes of bubbles, and bubbles within bubbles, the floating foam you blow will blow your mind. Do amazing things with bubbles! With the Slick Tricks kit, you won't literally have tricks up your sleeve, but you'll have the tools at hand to seemingly warp reality into a wisp and watch it float away. 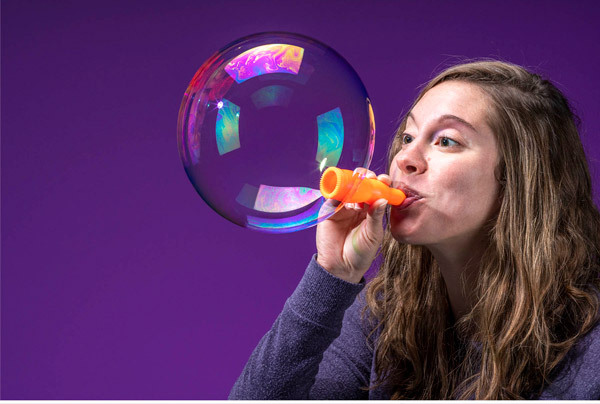 The kit includes a collection of instruments that will enable you to manipulate bubbles with twenty different bubble tricks! Your talents will blow them away. 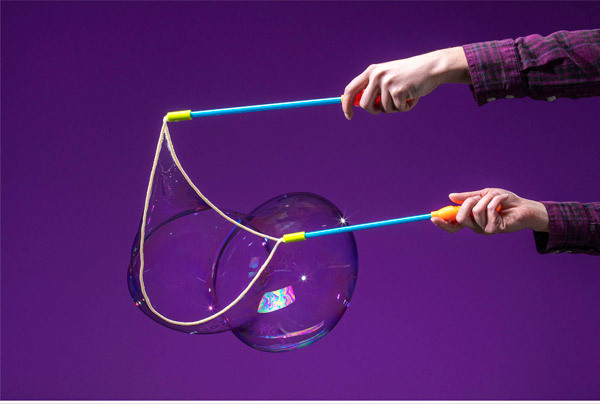 To be a true bubble master, you can't settle for the solution you got at the dollar store. That's why this kit includes four bottles of special solution, enabling you to make the slickest tricks. 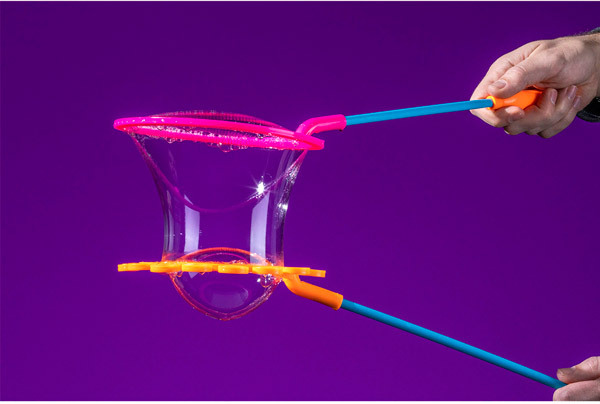 Bouncing bubble solution creates robust bubbles that can rebound off of a surface intact. 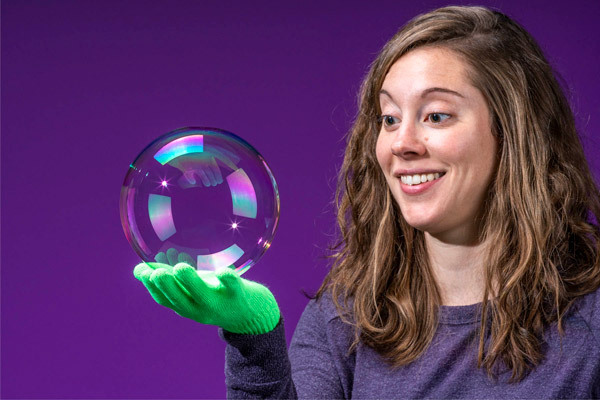 Touchable bubble solution creates bubbles you can hold in your hand without them popping. And a pair of Premium bubble solution bottles will supply you with the juice needed to pull off plenty more tricks. The kit includes 3 kinds of solution: 1x Bouncing, 1x Touchable, and 2x Premium. Performing tricks takes more than a (bubble) wand. The kit includes a bouncing bubble blower, two gloves, a bubble foamer, fifteen connector tubes and eight joints, two bottles of premium bubble solution, a bottle of touchable bubble solution, a bottle of bouncing bubble solution, a finger wand, a ringlet wand, a circle wand, a bubble loop, two wand handles and tubes, a drip tray, a string loop, a bubble net, and an instruction booklet. Slick Tricks includes gloves, 9 tools, 15 tubes, 8 joints, 4 bottles of solution, a dip tray, and detailed instructions. Question: Is it hard to use? Answer: Many of the tricks require specific techniques explained in the instruction booklet, but with practice, you'll be a bubble boss in no time. Question: What are all the tricks you can do? 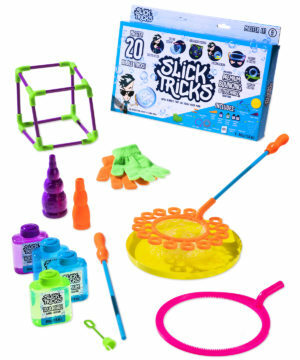 Answer: The twenty tricks in the kit are bouncing bubbles, dancing bubbles, catch a bubble, super long bubble, bubble chain, mini bubble mayhem, spinning bubble on a straw, spinning bubbles, bubble dome, bubble palace, bubble galaxy, bubble escape, bubble bundle, cube bubbles, geometric bubbles, bubble loop, bubble storm, bubble snake, stretch a bubble, shrinking bubble with a hole, parachute bubbles, and stacking bubbles.